Jim Ver Steeg (University Communications): Thanks so much for sitting down with me today. I’m wondering if we might start by talking about how you came to understand and identify yourself as a trans person. Chloe Corcoran (Alumni Relations): Sure, my pleasure. My earliest memory of being trans was praying that I would wake up as a girl. One day I did; it just took longer than I had hoped for. Eventually, I just hit the point where I knew I needed to transition. I was very fortunate to have a lot of support that I did not expect in my life. But it was interesting. When I knew I couldn’t keep it secret anymore, I wrote coming out emails to my family. I also wrote to an author to thank her for her for her work. She wrote back, which was amazing, and said, “Now it’s your job to do for others whatever it is you feel I’ve done for you.” What I felt she had done for me was exist, be visible, and fight for equal rights and equal treatment. That was a big point of change for me. Jim: You attended Rochester for undergraduate school. Do you keep in touch with your friends? Chloe: I played football when I was in college. I was a four-year varsity football player. I was very nervous about telling my former teammates, especially the ones that I had been close to. They’re scattered across the US now, but one of them lives here in Rochester and he came to my coming out party. He and his wife gave me a wonderful gift, in addition to being there, which was a gift in itself. 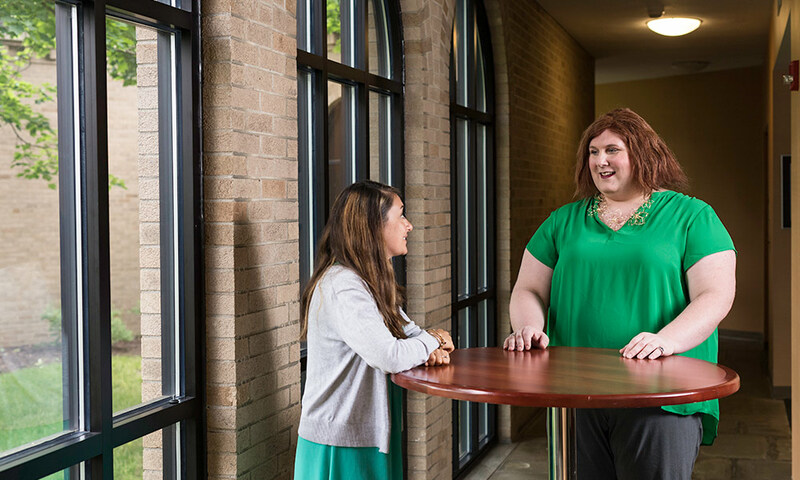 Jim: How did you approach your transition to living openly as a woman here at the university? Did you prepare your friends and colleagues for the change? Chloe: I did some prep and worked with some human resources partners and others to line everything up. I was out for a little bit, and while I was out they announced at an all-staff meeting that I would be returning as Chloe. Apparently, it went very well. I have to say I received over 40 emails of support from colleagues, which was just wonderful. It made my life a lot better. It made me less scared. It made me less nervous to come back to work. Just knowing that I had support from the people that I worked with—that I spend so much time with—was really important. Jim: Has anyone treated you differently since you’ve returned to work? Chloe: You know, I haven’t really noticed much of a difference. I think people are about doing good work and everybody’s been friendly. I’m so fortunate to have friends in the workplace. Transitioning can be a nerve-racking experience. Early on, I had people who would walk with me to meetings and just kind of help me through those early days. That was really beneficial to me—it made me feel like I wasn’t completely on my own. Jim: You recently accepted the position of associate director for identity-based programming in Alumni Relations. What’s the focus of your work? Jim: What do you say to critics who say we don’t need identity-based alumni events? Chloe: I say representation matters—and it matters for a lot of different reasons. People want to see themselves in the entities and institutions they’ve been a part of. Here’s an example from my personal life: I gave a speech not too long ago and a woman come up to me afterward and said, “I just want to thank you. You’re an inspiration to me and my family.” And I thought, “Well, that’s wonderful.” But I didn’t understand the family piece. Later, the woman came back so her daughter could introduce herself, and her daughter was young and said, “I’m transgender too.” I realized then that I was a representation for her that I didn’t have when I was growing up, and how important that was for this mother to see people out there doing things who look like you. So, for the University to get involved with that is important, too. It’s a reflection of our values, and it’s a reflection of the different ways people exist in the world. We want to make sure that we recognize our alumni in the same way. Jim: How does your work fit in with the Diversity Advisory Council? Chloe: The Diversity Advisory Council advises us on our strategies for inclusion. They’re fantastic. The council asks some of the tough questions that make my colleagues and I really think about our programming. But they don’t just ask questions; they offer advice, which is great. Most importantly, they don’t pose questions without potential solutions. I would say the entire council is really strong in different areas. We have some people who are great with data. We have some people who are great with marketing. We have some people who are great with oversight and asking those tough questions. It’s a real benefit to have a group that will ask questions about our programming and the ways it will serve our alumni. Jim: Coming out as trans seems to take a considerable amount of courage. Did you have a sense the University, especially Alumni Relations, was an accepting, affirming place? Chloe: There were a lot of positive signs, but to be honest, I wasn’t sure. But that’s because you hear all of the horror stories out in the world. We have employment protections at the University of Rochester, but others don’t, so we’re very fortunate. Still, the worst-case scenarios would run through my head, and that’s part of what kept me from coming out for a long time. You can hear organizations say they’re supportive but it doesn’t always work out that way—especially in a very outward-facing environment and position, it can be difficult. Jim: It seems like a good sign that your role is rather public, and that your position allows you to champion this kind of inclusion. Jim: You’re also pursuing your PhD in higher education at the Warner School. What’s your focus? Chloe: I’d like to use my PhD to do further research on equity and inclusion. That’s something I’m hoping to do in my dissertation. I’m not exactly sure how I’m going to do that yet, but having an idea of how we use space and place and what that really means is something I’m exploring right now. Jim: What do you think about the University’s efforts toward diversity and inclusion? Chloe: We’re very fortunate. I look at some of the offices that are doing diversity and inclusion work across the University and they work so hard and they do such a great job. But I think there are a lot of opportunities for us to do better. There are always going to be issues, roadblocks, and trips and falls, and it’s easy to point at incidents and say, “Well, this thing happened, or that thing happened.” When bad things happen, it’s very unfortunate and those issues need to be addressed. But recognizing those incidents and being able to talk about them and bring them out into the open is part of making things better. I also feel personally fortunate because a lot of transitions don’t go this way. The truth is a lot of trans people really struggle. I’d be remiss if I didn’t thank all the people in my life who have supported me on this journey.